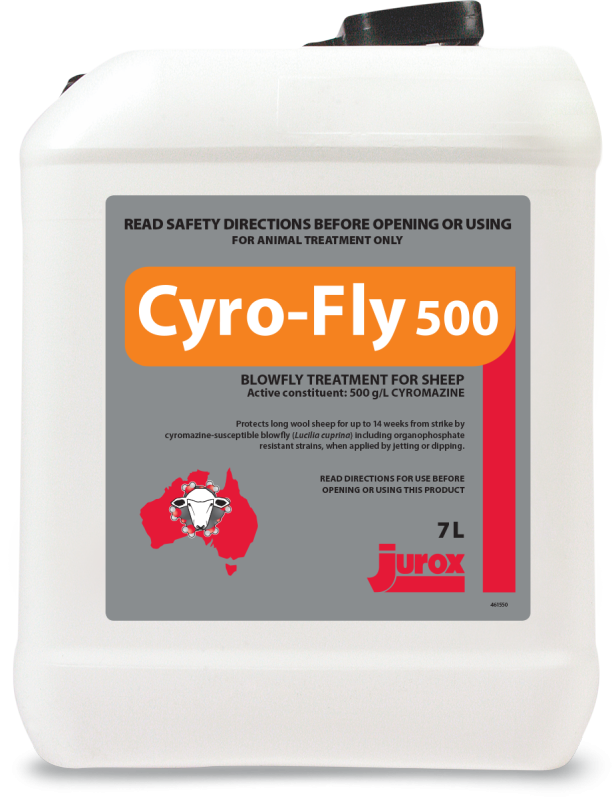 Cyro-Fly 500 protects long wool sheep for up to 14 weeks from strike by blowfly (Lucilia cuprina), including organophosphate resistant strains, when applied by jetting or dipping. Milk: DO NOT USE on female sheep which are producing, or may in future produce milk or milk products for human consumption. Wool: DO NOT USE less than 2 months before shearing or fibre collection. Sheep Blowfly control (Lucilia cuprina) Jetting 2 L per 1000 L 1. Apply 2–4 L of jetting fluid per sheep, depending on sheep size and wool length. 2. Ensure saturation to the skin. 3. Pay particular attention to treatment of the crutch, pizzle and poll. 4. Jet at onset of blowfly waves. 5. This product is not recommended for use in jetting races because a reduced period of protection may result. Dipping (Plunge, shower, and Constant Replenishment) 2 L per 1000 L 2 L per 1000 L 1. Dip sheep at onset of fly wave. 2. Thoroughly saturate sheep. When using a shower dip, run top and bottom sprays independently to ensure maximum pressure and therefore penetration. 3. The product is a non-stripping dip, so there is no need to reinforce during dipping. Dressing 2 L per 1000 L 1. Clip the wool surrounding the strike.Treat the struck area and the surrounding wool with a commended diazinon knock down product, then thoroughly jet the sheep with Cyro-Fly 500. 2. This product is a slow killing larvicide and, when used on its own, larvae may take 3–4 days to die.